So, you’re ready to adopt a bunny and you need to prepare their living space. You may not know where to start, but we can help! Please see the image below for details on what to include in their space. Many of these items are available in our Hop Shop. If we’re out of stock or you’d prefer to purchase them elsewhere, we can assist you with information on where they can typically be purchased. Here are some additional tips before you bring your bunny home! In addition to these housing items, you’ll also want litter, pellets, hay, and greens. Please view our information on bunny diet and litter boxes. We do not advise bunnies use water bottles. They are messy and bunnies have difficulty drinking from them. There are some special cases in which your adoption coordinator may advise using them for medical reasons. 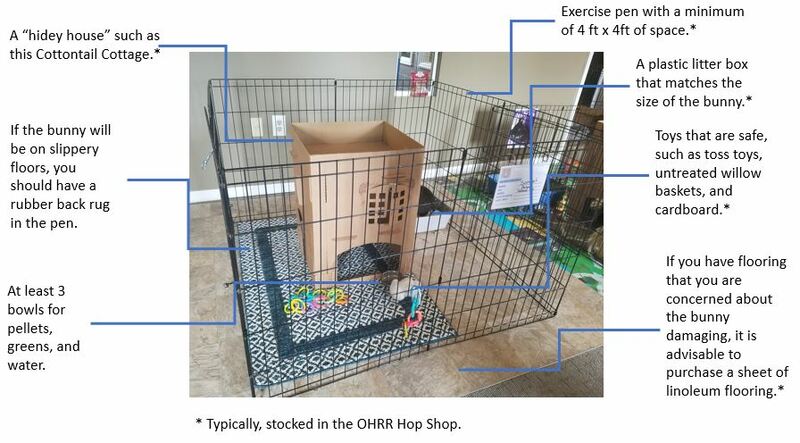 Our housing requirements are a minimum 4 ft x 4 ft of indoor space in a location where the bunny is part of the family, can receive regular attention, and continue to be socialized. The bunny should also get out of the 4 ft x 4 ft space for regular exercise. We do not permit small cages, outdoor hutches, or wire bottom cages. Many of our adopted bunnies live in free roam homes, or have an entire room for themselves. This is great for the bunnies! However, we do advise “bunny proofing” your home or room by protecting exposed wires and cords with products such as Critter Cord or Split Wire Loom Tubing. This will keep your bunny and electronics safe! Providing your bunny with plenty of toys, that are regularly alternated, will keep them entertained and help prevent them from being destructive in other areas. Typically, when bunnies are chewing or destroying objects that are not theirs, it’s because they don’t have enough toys to chew. Unfortunately, many pet stores sell bunny toys that are labeled as safe, but are not actually safe. Stay away from things with nuts, seeds, and corn. If you are unsure of the safety, it is better to avoid it. If you want some ideas for safe toys, try binkybunny.com, smallpetselect.com, or even our Wish List. You may also view our DIY bunny toys page for quick and easy ideas for toys. Keep houseplants out of reach. They are poisonous to bunnies! Pro Tip! Worried about your bunny "marking" their new space with urine? A mixture of 50% distilled white vinegar and 50% water in a spray bottle will completely eliminate urine spots on floors, carpets, and rugs. The mixture is safe for the bunny. You can also use this spray along with dish soap and warm water to clean your bunny's litter box.